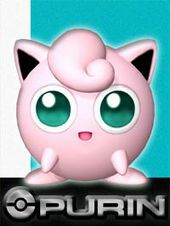 Jigglypuff is a Normal/Fairy-type Pokémon from the Pokémon series. Its first appearance was in the Japanese Pokémon Red and Pokémon Green, which later became the international Pokémon Red Version and Pokémon Blue Version. Classified as the Balloon Pokémon, Jigglypuff evolves from Igglybuff and into Wigglytuff. Jigglypuff appears out of a thrown Poké Ball. Jigglypuff's appearance from Super Smash Bros.
Jigglypuff is first seen in the original Super Smash Bros. Jigglypuff is one of the four unlockable characters, unlocked by clearing 1P Game once, and then defeating it on Saffron City. Jigglypuff is voiced by Rachael Lillis in English and Mika Kanai in the original Japanese, its respective voice actors in Pokémon media. Jigglypuff was designed to be the weakest character in the game. 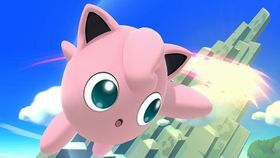 Jigglypuff is the lightest playable character; while it has up to five midair jumps, tied with Kirby for the most, Jigglypuff can also be launched the easiest. In addition, when Jigglypuff's shield breaks, it is launched higher into the air than any other character, potentially KOing it. 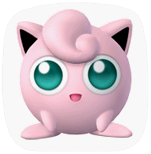 Jigglypuff also has a high air speed and the lowest falling speed, but also has low walking and dashing speeds. Its attacks are also slow and weak. 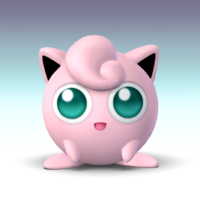 Jigglypuff's neutral special is Pound, in which it slaps an opponents. Its up special is Sing, which puts nearby opponents to sleep, and its down special is Rest, which sends any opponents close enough flying but puts Jigglypuff to sleep. Jigglypuff returns in Super Smash Bros. Melee. According to its page on the Japanese website, Sakurai was torn over whether to have Jigglypuff return or not, but kept it so as to not leave behind fans of the character. Like in the previous game it can be unlocked by clearing Classic mode, or by playing 50 Melee matches, and defeating it on Pokémon Stadium. Like other re-introduced characters, Jigglypuff's neutral special move, Pound, was made into its side special move, and its new neutral special move is Rollout, which allows Jigglypuff to charge an attack in which it rolls across the screen. Its air speed has been increased for this game, giving it the highest air speed of any character. All of Jigglypuff's jumps also now give height, though the height given decreases as it continues to jump. In Super Smash Bros. Brawl, Jigglypuff returns as an unlockable character once again. It can be unlocked by clearing at least 20 Events after finishing The Subspace Emissary, playing 350 Brawl Matches, or having it join the party in The Subspace Emissary. Similar to the previous game, Jigglypuff (along with Wolf and Toon Link) was nearly cut from the game due to time constraints. While Jigglypuff's general moveset is unchanged, it has been given a Final Smash, Puff Up. Jigglypuff increases in size dramatically, bouncing players off of it at great speed. Like Toon Link and Wolf, it makes a rather minor Subspace Emissary appearance, and is the only veteran character who does not appear in the main story of the Subspace Emissary. After finding a red door in The Swamp stage, the player will be taken to Pokémon Stadium 2 and fight Jigglypuff in a one-stock match. Once defeated, it will join the player's party. Jigglypuff returns once again as an unlockable character in Super Smash Bros. for Nintendo 3DS, and for the first time as a default playable character in Super Smash Bros. for Wii U. It can be unlocked in the Nintendo 3DS version by collecting 30 pieces of equipment, or by winning 120 matches, and is the only playable Pokémon character to be unlockable in the game. All of its moves and its Final Smash from Super Smash Bros. Brawl are kept in this game. Jigglypuff appears as an unlockable playable character in Super Smash Bros. Ultimate. Compared to Super Smash Bros. for Nintendo 3DS / Wii U, it moves faster on the ground and in the air, and many of its attacks are more powerful. In addition, Jigglypuff makes an angry expression during its Puff Up move. Jigglypuff is not seen when the fighters oppose Galeem for the first time. However, like with the other non-DLC fighters except Kirby, it is hit by one of Galeem's beams of light and imprisoned in the World of Light, where a Puppet Fighter of it is created. The Jigglypuff Puppet Fighter is eventually defeated, freeing the real Jigglypuff who joins Kirby's team against Galeem and Dharkon. Jigglypuff's Classic Mode route is themed on the original Super Smash Bros..
Luigi, Ness, Captain Falcon, Jigglypuff Battlefield Final Destination - Super Smash Bros. 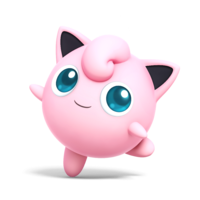 Pound is Jigglypuff's standard special move in Super Smash Bros., becoming its side special move in Super Smash Bros. Melee onward, having been replaced with Rollout, based upon the Normal-type move in the Pokémon series. When used, Jigglypuff steps forward and slaps opponents. In Super Smash Bros., the attack sends them diagonally into the air if it hits. In Super Smash Bros. Melee, the attack knocks back vertically when used up close, and horizontally when hit from farther away, while in Super Smash Bros. Brawl this is reversed. Finally, in Super Smash Bros. for Nintendo 3DS / Wii U, the move knocks opponents directly up, no matter where it hits. If Pound is used in the air, Jigglypuff is sent forward as it slaps, which helps with its horizontal recovery. In Super Smash Bros. for Nintendo 3DS / Wii U, the first custom variant for Pound is Sideways Pound, which knocks opponents horizontally, similar to the original Super Smash Bros., but it also deals less damage, and cancels all of Jigglypuff's momentum. The second variant is Pound Blitz, which sends Jigglypuff sliding across the ground a further distance, and deals multiple hits while going through opponents. Rollout is Jigglypuff's standard special move starting with Super Smash Bros. Melee, replacing Pound, which is now its side special move, in Super Smash Bros., and based upon the move in the Pokémon series. By holding down the special move button, Jigglypuff charges the move by rolling in place, and starts to roll forward in the direction it was facing before charging, the roll lasting as long as the move was charged. The move deals the most damage and knockback at maximum charge, while it does not have any effect on opponents at minimum charge. The player can also turn around while rolling. If Jigglypuff hits an opponent while rolling, it automatically stops, bouncing into the air before returning to its normal position. Starting with Super Smash Bros. Brawl, the move has a "super charge" which does not increase its damage output but increases its distance both on the ground and in the air. The player can also angle the roll back when used in the air in Super Smash Bros. Brawl, and it also no longer leaves Jigglypuff helpless when used in the air. In Super Smash Bros. for Nintendo 3DS / Wii U, the first custom variant for Rollout is Relentless Rollout, which charges faster, moves faster, and deals multiple hits, never stopping after hitting an opponent, though it cannot be controlled as easily. The second is Raging Rollout, which is faster and deals more damage, but takes longer to charge and cannot be turned around. 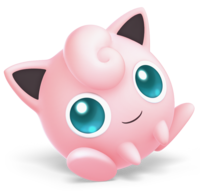 Sing is Jigglypuff's up special move, based on the Normal-type move recurring throughout the Pokémon series. 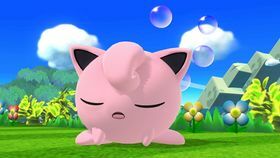 Unlike other up special moves, Jigglypuff does not get sent into the air, but instead sings, sending out sound waves that cause any opponents caught in them to fall asleep like in the games of origin. In Super Smash Bros., opponents with less damage remain asleep for longer, while in Super Smash Bros. Melee onward, opponents with more damage remain asleep longer, but can wake up faster by tapping the Control Stick or Circle Pad rapidly. In Super Smash Bros. for Nintendo 3DS / Wii U, the first custom variant for Sing is Hyper Voice, another move from the Pokémon series, which is an attacking variant that has greater range and deals greater damage as it goes on. Unlike with Sing, Hyper Voice can affect airborne targets, but Jigglypuff is still vulnerable while using this move. The second is Spinphony, where Jigglypuff creates three sound waves that can flip any opponents who get hit. However, the attack takes a very long time to execute, as its startup time and execution period are both very slow, and the sound waves deal very little damage to opponents as well. Rest is Jigglypuff's down special move, based on the move from the Pokémon series. 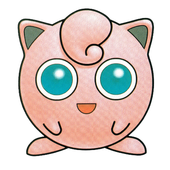 When used, Jigglypuff flinches before falling asleep and waking up several seconds later, leaving it open to attack. If used close to an opponent, however, they are launched into the air. In Super Smash Bros. Melee, this attack has a flame effect, while in Super Smash Bros. Brawl onward, this was changed to giving the opponent a flower on their head to increase their damage; the angle the attack launches at was also changed from a more diagonal one in the previous two games to a near-vertical one. In Super Smash Bros. for Nintendo 3DS / Wii U, the first custom variant for Rest is Leaping Rest, which sends Jigglypuff into the air before it falls asleep. The second is Wakie Wakie (spelled Wakey-Wakey in the PAL version), which causes Jigglypuff to rest for a shorter time, exploding when it wakes up; as it sleeps it also has a vortex surrounding it that pushes away opponents. Puff Up is Jigglypuff's Final Smash. When activated, Jigglypuff begins to inflate itself to a very large size, encompassing a large portion of the stage. 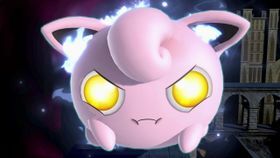 Opponents that make contact with Jigglypuff are pushed to the side. Once Jigglypuff reaches its peak height, opponents around it are slightly damaged and launched to the side. Jigglypuff then rapidly shrinks to its normal size. Strangely, the trophy showing Puff Up in Super Smash Bros. for Wii U shows Jigglypuff at its large size, but retaining the original color of its eyes. When using the move during battles, Jigglypuff's eyes are yellow the entire time. 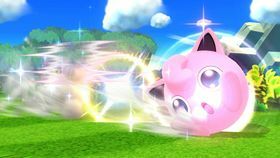 Additionally, the pitch of Jigglypuff's voice and sound effects during the move is altered based on the speed of the match, which can be adjusted in Special Smash or Training Mode. Jigglypuff's Final Smash is the only one with this property. Jigglypuff appears as one of the Costume Mario costumes in Super Mario Maker, which can be unlocked either by using the Jigglypuff amiibo or by clearing 100 Mario Challenge on Normal difficulty or greater. Its sprite is based upon the overworld sprite used in the Nintendo DS Pokémon games. Like the other Pokémon costumes, Jigglypuff does not have any altered sound effects. Snake: Jigglypuff? Is that some kind of marshmallow? Colonel: Jigglypuff is a balloon-shaped Pokémon. It may be light and puffy and full of air, but its Sleep ability is devastating. Snake: Sleep...? What's so devastating about it going to sleep? Colonel: The instant it falls asleep, there's a huge buildup of energy in its center of gravity. If it hits you, it's lights out for sure. Snake: So it puts a lot of energy into sleeping? Sounds pretty irresponsible if you ask me. Colonel: Takes all kinds, Snake. Especially here in Brawl. DS Pokémon Diamond/Pearl A Balloon Pokémon. It invites opponents in close with its big, round eyes, then puts them to sleep with a calming song. 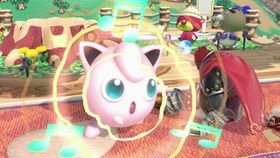 The secret to the song's unfailing efficacy is Jigglypuff's ability to sing on the wavelength that will make its opponent the sleepiest. It also uses Attract to infatuate opponents who touch it. It uses a Moon Stone to evolve into Wigglytuff. Wii Super Smash Bros. Brawl Jigglypuff's Final Smash. It wills its body to get bigger and bigger and bigger. It can't move, and it can't attack--all it can do is get bigger while everyone else looks on. However, it's invulnerable, and it overpowers all attacks to gradually push its opponents off the screen. It's a very simple technique, but how it's used determines its effectiveness. 3DS Pokémon X & Pokémon Y (10/2013) This Normal/Fairy-type Pokémon is best known for its soothing singing, which can put foes to sleep. In Smash Bros., it fights best in the air and can even jump six times in a row. The downside, though, is that Jigglypuff's so light, most opponents could launch it in their sleep! This Normal- and Fairy-type Pokémon is best known for its soothing singing, which quite often puts foes to sleep. In this game, Jigglypuff fights best in the air, and can even jump six times in a row. The downside, though, is that Jigglypuff's so light, just about any opponent could launch it in their sleep! 3DS Pokémon X & Pokémon Y (10/2013) Jigglypuff's down special Rest sends this Pokémon into a deep sleep that damages and launches any foe it's touching upon napping. They'll even take damage after being hit! It's a pretty challenging move to land, though, and it leaves Jigglypuff wide open to revenge. Be careful when you use it. When you use the Rest down special, you go into a deep sleep, as you'd expect. But if anyone is touching you when you do it, you'll inflict a lot of damage and launch them directly upwards. They even continue to take damage afterwards. It's not easy to pull off, though, and falling asleep leaves you open to attacks, so be careful. N/A When Jigglypuff uses its Final Smash, it starts to grow bigger. And bigger. And bigger! Before you know it, Jigglypuff will have completely taken over the screen-and there's no way to make it stop. On smaller stages, fighters may find there's nowhere left to stand! At near full size, Jigglypuff will damage and launch anyone it touches. It doesn't deal a lot of damage or launch opponents a long way. No, when Jigglypuff uses its Final Smash, it gets...bigger. And bigger. And bigger. Before you know it, Jigglypuff will have completely taken over the screen - and there's no way to make it stop. On smaller stages, fighters may find there's nowhere left to stand! Pit: That's Jigglypuff, the Balloon Pokémon. Viridi: Look at the way it floats! It must be light as air. Palutena: Don't let it's cuddly appearance fool you. Its one of the most aerodynamic fighters out there. And it has a deadly attack called Rest. When Jigglypuff lands the move, the effects can be devastating. Viridi: However, that move does render Jigglypuff vulnerable for a short period of time afterward. Palutena: So when you see Jigglypuff start to fall asleep, that's your cue to move in for the kill. Pit: Gotcha. I'll be sure to keep an eye out for when it nods off. Purin The Japanese term for "pudding". May also be a combination of "fūsen" (風船, balloon) and "fukuren" (膨れる, to expand). French Rondoudou From "rond" (round, chubby), "roudoudou" (a French word for a affectionate nickname for childs), "doudou" (a doll for the childs' comfort) and "doux" (soft). German Pummeluff From "pummelig" (chubby) and "fluff". Purin Transliteration of the Japanese name. Pàngdīng A corruption of the Japanese name. 球 ("kàuh") mean "ball". Combination of 胖 ("pàng", fat) and 布丁 ("bùdīng", pudding). Jigglypuff only has five recolors in Super Smash Bros. Brawl, instead of the usual six. This is also shared with Pokémon Trainer, Lucario, and Sonic. Jigglypuff is the only starting fighter in Super Smash Bros. for Wii U to have a character-specific challenge that's immune to the Golden Hammer. In Super Smash Bros. Melee, a CPU Jigglypuff uses Sing after using up all of its mid-air jumps, which causes it to get KO'd if it's trying to recover. ↑ 1.0 1.1 nocturnal YL (October 13, 2015). News Flash! Smash Bros. Dojo: Jigglypuff. Source Gaming. Retrieved August 18, 2016. ↑ Soma (August 17, 2015). Sakurai answers some (old) questions– about Brawl! Source Gaming. Retrieved August 18, 2016. This page was last edited on March 19, 2019, at 07:39.